Is your smile in need of a little extra cosmetic enhancement? 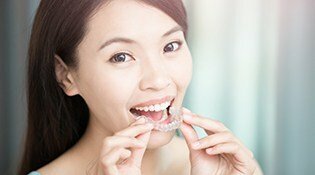 At Cartwright Orthodontics, we recommend Simpli5 Clear Aligners as a fast and simple orthodontic system that can create dazzling improvements for your appearance and your self-confidence. Instead of wires and brackets, Simpli5 uses clear aligners that blend in well with your natural look to correct minor misalignment and spacing issues. If you’re interested in learning more, contact our McMurrayoffice or Bethel Park office today to schedule a consultation with Dr. Gary Cartwright! Our team looks forward to meeting you. After you’ve undergone your initial orthodontic consultation and we’ve determined that Simpli5 is the right choice for your smile’s needs, we will capture impressions of your teeth so that customized, clear aligners can be crafted based on them. Each aligner in the series needs to be worn for a period of about three to four weeks – during this time, your teeth are gradually shifting into their ideal alignment! When the tray starts to feel loose, that means it’s time to get the next one, and so on and so forth until all the trays have been worn for the recommended period of time. Patients will also need to visit Dr. Cartwright for a brief checkup every six weeks to ensure that your treatment is progressing smoothly and without any hiccups. 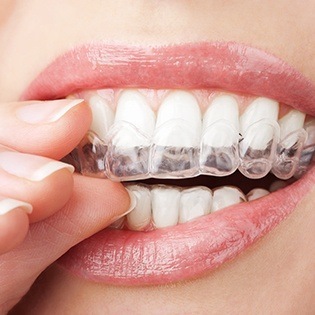 In most cases, you can expect your treatment with Simpli5 Clear aligners to last for around three to five months on average, with anywhere from three to five aligners worn during that time period. What Are The Benefits of Choosing Simpli5? Simpli5 aligners are completely clear, which means that they blend in well with your smile and will be difficult to notice by others. Instead, they let your natural, confident appearance shine through! As stated above, the treatment process is exceptionally quick, and your smile’s alignment will start to improve right away. The Simpli5 aligners are easily removable, which allows you to eat your favorite foods without restriction and brush and floss like you normally would – no restrictions required. 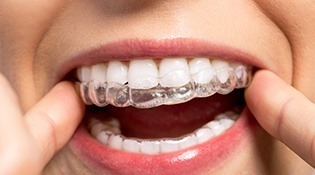 After a very short adjustment period, most patients find it very easy to wear and talk with the aligners on. There’s no need for uncomfortable wires or painful adjustments with Simpli5. The aligners are custom-made for your unique mouth, and they should fit comfortably when worn. Simpli5 aligners cost up to 20% less on average than other similar tooth alignment systems. It’s important to remember, though, that Simpli5 works best for patients with relatively minor orthodontic concerns, such as slightly crooked teeth or mild overcrowding. It can also be used to correct orthodontic relapse (cases where retainer use has been lacking and treated teeth have started to shift back to their initial position) in the early stages. If your needs are more complex, you’ll need to explore other options like metal or ceramic braces with our team’s professional guidance.